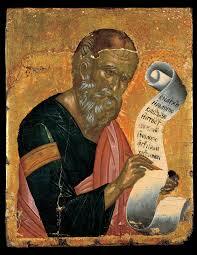 St. Apostle, Evangelist and Theologian John. Orthros and Divine Liturgy. The feast today in honour of the holy Apostle John commemorates the miracle taking place each year in Ephesus, in which a certain dust or powder, called manna, suddenly poured forth from his tomb and was used by the faithful for deliverance from maladies of both soul and body. For an account of his life, see September 26.
Who can recount your greatness, O virgin, for miracles flow and healing springs forth from you. You intercede for our souls, as the Theologian and friend of Christ. Sunday of Samaritan woman. Orthros and Divine Liturgy. Holy Ascension. Orhros and Divine Liturgy.